Paul's affection for the Corinthian church and his endurance through hardship for their joy testifies to his deep devotion to Christ. His example and instruction in this letter inspires us to find our joy in Jesus. In both volumes of A Sincere and Pure Devotion to Christ, Storms provides readers with fifty daily meditations on this great epistle that are both accessible and substantive. His analysis and application of the biblical text make these meditations suitable for private devotions or small group studies, or as a commentary for Bible study, Sunday School lessons, or sermon preparation. "There are few people on the planet who embody in life and in teaching the radically biblical and Edwardsian message of Christian Hedonism better than Sam Storms." 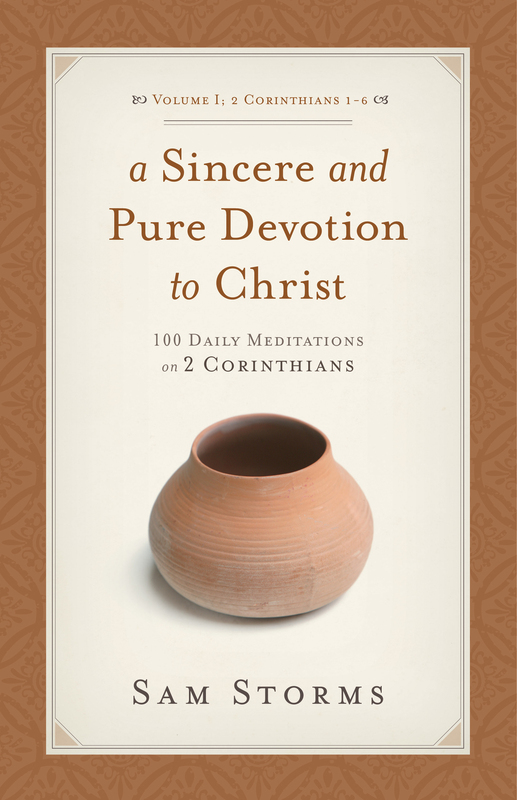 "Sam Storms has served a splendid reflection on 2 Corinthians that will benefit readers at all levels. Those with no theological training will profit from an accessible and clear style, learning not only the rich content of 2 Corinthians, but also how to study the Bible and apply it to life. Those with questions about what happens after someone dies, or how to handle discouragement, or how we can be more confident in sharing our faith with others will find biblical answers. Pastors preparing for sermons on 2 Corinthians will appreciate Storms' interaction with commentators, his careful exegetical decisions, and the pastoral application of 2 Corinthians. This book is exegetically responsible, theologically profound, and pastorally relevant. I highly recommend it." Storms in his usual clear, engaging, heartwarming style unlocks perhaps "Paul's most personal and Christ-centered letter. You will be reminded afresh that everything really is all about Jesus. Release the life-changing power of this much neglected letter as Storms demonstrates that its message can change you in every way."